In stock -This product will ship today if ordered within the next 10 hours and 27 minutes. 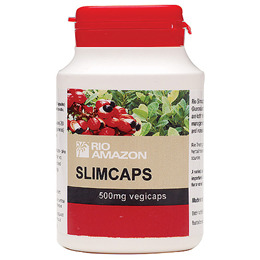 RIO AMAZON SlimCaps helps to maintain a healthy body weight. May help you feel more energetic and alert. 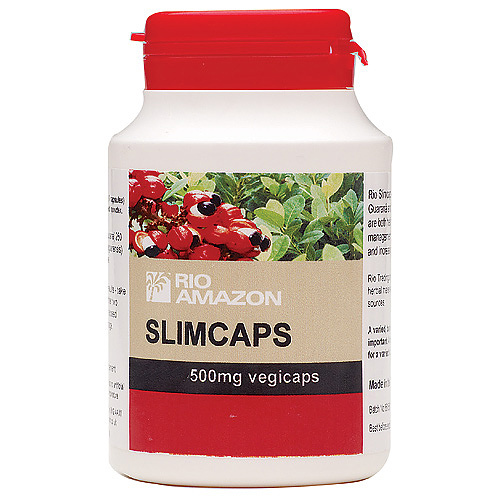 Slimcaps are a blend of two popular South American herbs - Yerba Maté and Guaraná. Yerba Maté is a South American tree that is cultivated to produce a green leaf tea. It contains vitamins and minerals, including magnesium, vitamin C, and B-complex vitamins. Maté also provides fifteen amino acids, plant sterols and saponins. It is a very good source of antioxidants called polyphenols - more than average Green tea. Yerba Maté contains naturally occuring caffeine (between 0.7-2%) but because the caffeine is part of a complex called Mateine it is noticeably different in its benefits to tea or coffee. Capsules can be used as an nutrients supplement - or, like Green tea capsules, can be used to contribute to the maintenance of a healthy body weight. The other active in Slimcaps - Guaraná seed, is a creeping shrub native to the Amazon rainforest that produces clusters of small bright red fruit, the seed of which has been used by indigenous tribes for centuries to help maintain mental awareness. It gains its energizing benefits from a number of actives that are found in the seed. These include caffeine and two other stimulants -theophylline and theobromine. These stimulants are found in a complex named Guaranine that provides gentle stimulation over a period of several hours, without the peak and trough in energy that is associated with many sources of caffeine. Contains: caffeine and other xanthines. Below are reviews of RIO AMAZON SlimCaps - Body Weight -180 x 500mg Vegicaps by bodykind customers. If you have tried this product we'd love to hear what you think so please leave a review.